A leisure break in London would give you the perfect base to explore England’s capital city. If you haven’t got time to make use of the spa facilities but would like them there just in case you need to rest a tired body after miles of walking visiting all the attractions, then a leisure break would be perfect for you. 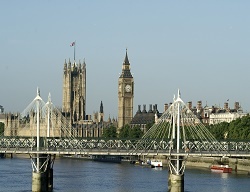 London is a world renowned attraction in its self and you may need two or three nights away. We can tailor any of our packages for longer stays at any advertised venues, please call us for free on 0800 012 2000or email us to enquire about a longer stay at one of our venues. We’ll do our best to find your perfect break.